One of the main goals of the Strengthening Tanzanian Publishing (TZAP) project is to increase the quality of Tanzanian research output. 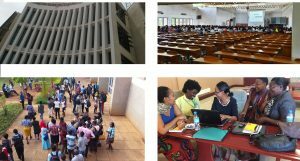 In order to achieve this goal, TZAP’s partners organized a forum to discuss intellectual property (IP) policies at Tanzanian universities and research institutes. The Tanzania Commission of Science and Technology (COSTECH, one of the project’s partners) is working with universities to register their research. As the Tanzanian government wants the country to focus on translational research, all universities should include a section on licensing or commercializing their technology in their research policy. A few universities already have a policy in place, but most of them do not. COSTECH is working with the World Intellectual Property Organization (WIPO) to raise awareness about IP. The newly established Consortium of Academic Publishers will also assist in creating more awareness about IP with its members. COSTECH recently facilitated a workshop on supporting bioscience innovation and commercialization of research results. The topic of intellectual property will also be high on the agenda at Tanzania’s fourth Annual National Science, Technology and Innovation (STI) Conference to be held in Dar es Salaam in June. Next to raising awareness about IP, COSTECH is collaborating with COSOTA (The Copyright Society of Tanzania) to increase knowledge about copyright issues in Tanzania. COSOTA registers works and collects royalties on behalf of authors and performers. A big part of their work involves collecting and destroying illegally-copied books and DVDs. Alongside this, COSOTA is working on a new regulation about how to charge universities for photocopying teaching materials. Maureen Fondo, legal advisor at COSOTA, has informed us that plagiarism of and within dissertations happens frequently. Most participants present at our workshops confirm this and many fear that, with increased access to online content, students will be more tempted to copy material. In our workshops we have also focused on ethics, plagiarism and copyright issues to emphasize that the digital and print world have much in common. 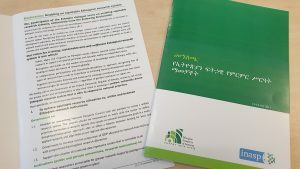 Several universities plan to update their dissertation policies and, as many Tanzanian universities and research institutes are starting to build their institutional repositories, it is good to raise awareness about what publishers allow. We explained the concepts of green and gold open access and the different Creative Commons licences. During our workshops we not only try to raise awareness about copyright issues with university presses, but with the commercial publishers as well. Many of them seem hesitant about publishing books online, afraid that their publications will be plagiarized. We have covered topics such as Digital Rights Management, watermarking and online data clean-up policies to take away some of their worries. As more and more people are getting smartphones in Tanzania, going digital might be the way forward for Tanzanian publishing. By having participants create their own ePub files, they get a first insight into digitizing content. 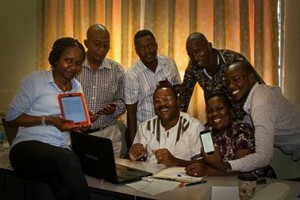 During one of the workshop exercises, participants had to create content for different devices such as e-readers and smartphones. This gave the participants a good idea of the possibilities of digital publishing and they were very enthusiastic about loading content onto their own smartphones. However exciting creating digital content may be, Dar es Salaam days are still very hot, and huge Tanzanian lunches can make the participants (and facilitators) sleepy. Luckily, getting up and singing “head, shoulders, knees and toes” in English, Dutch and Kiswahili makes everyone alert and awake again. Tanzania’s warmest months have passed and we are well into the rainy season now. Roads, bridges and entire neighbourhoods get flooded and the thunder storms have a negative effect on power and internet availability. During one of the workshop exercises, participants had to list the advantages and disadvantages of digital publishing. And one of the big disadvantages is poor internet connectivity and power cuts. 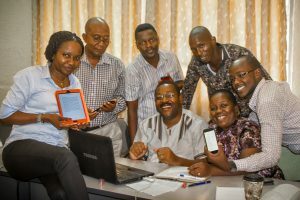 Lecturers at St Augustine University in Mwanza stress that in their region (North-West Tanzania) internet access is more irregular than in Dar es Salaam, and this makes it even harder for researchers to access online research materials. Nevertheless, the lecturers in Mwanza do realize the importance of publishing and see the opportunities of going digital. Lobbying with government and other organizations to raise the level of ICT to strengthen digital publishing throughout the country is one of the other tasks of the newly established interim committee of the Consortium of Academic Publishers of Tanzania. A full agenda! In my next blog you will read about our workshops on Marketing and Communication and how the Consortium implements the acquired skills in further advancing academic publishing in Tanzania. See also the blog post by Geraldine Lovell, one of the facilitators of the workshop on Digital Publishing. Follow discussions and latest updates from the TZAP project with the hashtag #TZAP.